A wireless sensor network (WSN) is a collection of nodes organized into a cooperative network, which are small energy constrained devices The efficient use of energy source in a sensor node is most desirable criteria for prolong the life time of wireless sensor network. So designing efficient routing for reducing energy consumption is the important factor. The energy consumed in cluster head (CH) selection phase of a random cluster based wireless sensor network (WSN) has been assumed as an insignificant factor in the previous research works. In this paper, the consumption of energy during the transmission of data from sensor nodes to the sink has been calculated. Routing protocols in WSNs along with the most energy efficient protocol named LEACH ( low energy adaptive clustering hierarchy) and STR protocol (shortest tree routing protocol) along with its advantages and disadvantages are discussed here. In this paper we improved the energy consumption of the node to get the parameters result such as energy, delay, throughput, jitter and pdr. Jayashri Gaurkar, Kanchan Dhote. "Report on Design of distributed Energy Efficient and reliable Routing Protocol for Wireless Sensor Networks." 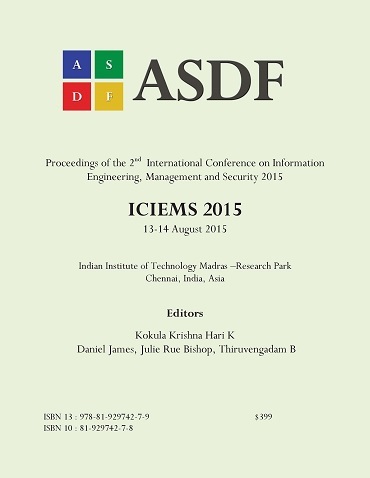 International Conference on Information Engineering, Management and Security (2015): 208-214. Print.